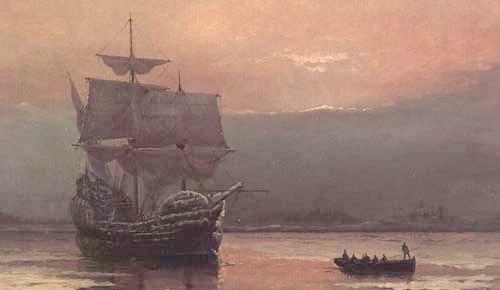 "Mayflower in Plymouth Harbor," by William Halsall (1882). The original oil painting may be seen in Pilgrim Hall Museum, Plymouth, Massachusetts. Larger image. It wasn't until 1840 that the term "Pilgrim" came to refer to the early Mayflower settlers. The congregation moved to Holland in 1607 where religious freedom was greater. Some who were in prison, didn't get there for another year. Crew Members — seamen aboard the Mayflower, some of whom were contracted to work in the Plymouth Colony for a year or longer. The "strangers" weren't non-Christians. They were probably members of the Church of England and would count themselves as Christians. But they didn't share the Separatists' refusal to be a part of what they considered to be the corrupt state church. We ought to make a couple of distinctions here. Strictly speaking, Separatists were pious Christians who had given up on the Church of England and formed their own congregations. Puritans, on the other hand, were members of the Church of England who wanted to purify the Church from its worldliness and corruption. Instead of separating (in the early days), they formed religious societies within Anglican congregations. A number of these groups, like the Mayflower group, fled to Holland. They were the beginnings of the Congregationalist and Baptist churches that put down early roots in America. Though the Plymouth Colony was the first Separatist colony in New England, the Puritan Massachusetts Bay Colony was established by royal charter in 1629. But apparently the Massachusetts Puritans had something in common with the Plymouth Separatists even before they sailed for America — the autonomy of the local congregation and a restriction of membership to "those predestined to be God's elect. "4 As time went on the churches in Plymouth and the Massachusetts Bay Colony came to resemble each other. "These all died in faith, not having received the promises, but having seen them afar off, and were persuaded of them, and embraced them, and confessed that they were strangers and pilgrims on the earth. For they that say such things declare plainly that they seek a country. And truly, if they had been mindful of that country from whence they came out, they might have had opportunity to have returned. But now they desire a better country, that is, an heavenly: wherefore God is not ashamed to be called their God: for he hath prepared for them a city" (Hebrews 11:13-16, KJV). General background information comes from: Eugene Aubrey Stratton, Plymouth Colony: Its History and People 1620-1691 (Salt Lake City: Ancestry Publishing, 1986), 481 pages, paperback. George F. Willison, Saints and Strangers (New York: Reynal & Hitchcock, 1945), 513 pages, hardcover. Albert Matthews' exhaustive history of the use of the term "Pilgrim Fathers" is found in the Colonial Society of Massachusetts Publications XVII (1915) 300-392. William Bradford, Of Plymouth Plantation (1620-1647), chapter 1.